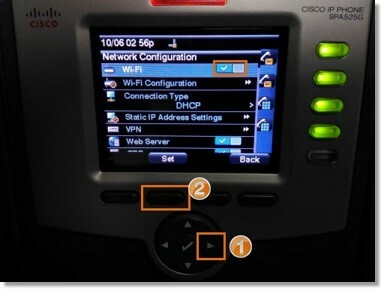 Cisco SPA525g or SPA525g2 phones allow you to connect to a Wi­Fi network manually. You can connect using the Wireless Profile or connect using the Wi­Fi Protected Setup. 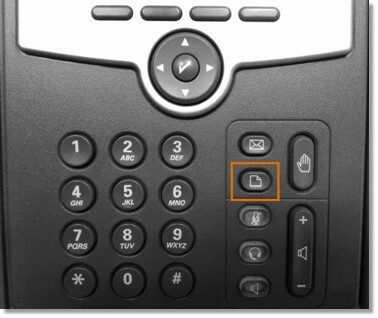 The Cisco SPA525g and the Cisco SPA525g2 desk phones are 5­line IP Phones with color display and wireless capability, manufactured by Cisco Systems. 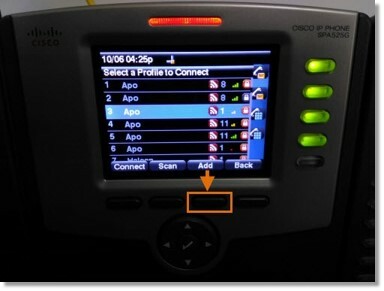 Follow these steps when connecting these phones to a wireless network. 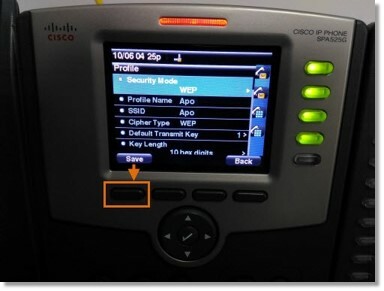 Note: Before setting up the Cisco SPA525g network, make sure you know the following details for the network you will connect to. IMPORTANT: Disconnect the Ethernet cable from the Cisco phone to activate the Wireless feature. 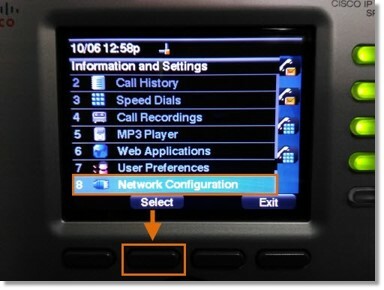 When the Ethernet cable is connected to the phone, the phone’s Wi­Fi connection is disabled. Power ON the phone using the power adapter that came with the device. 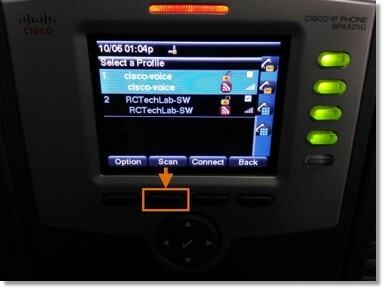 Press the Setup button on your Cisco phone. 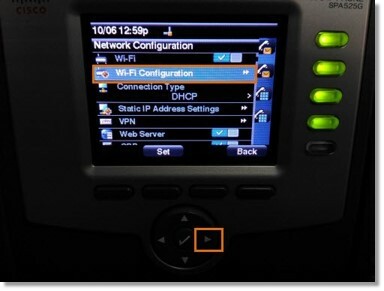 Go to Network Configuration and then press the Select key. Go to Wi­Fi and then press the phone’s Right Arrow key to toggle Wi­Fi ON, and then press Set. 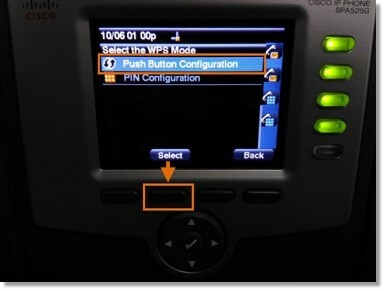 Go to Wi­Fi Configuration and press the Right arrow key. 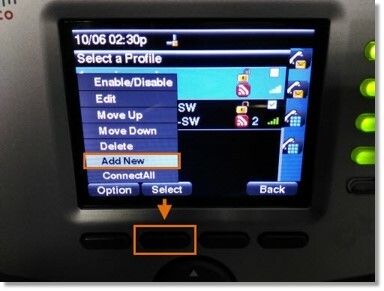 Wireless Profile ­ – Use this option to add a new or edit an existing wireless profile. Go to Wireless Profile, and then press Select. Highlight the network that you wish to connect to, and then press Add. Enter the required setting to connect your network, and then press Save. Highlight Add New, and then press Select. SSID ­ This is the wireless network’s name. 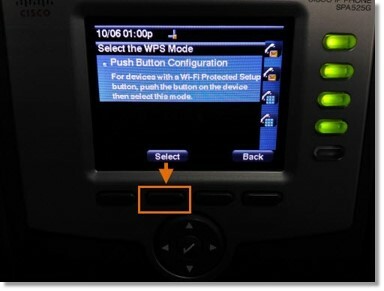 If your router has a WPS button, you can use Wi­Fi Protected Setup to add a new wireless network profile. 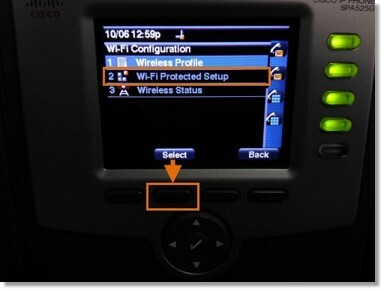 Under Wireless Configuration, select Wi­Fi Protected Setup. On your phone, highlight Push Button Configuration, and then press Select. On your phone, highlight PIN Configuration, and the press Select. The PIN will be displayed on your phone. Note the PIN displayed. 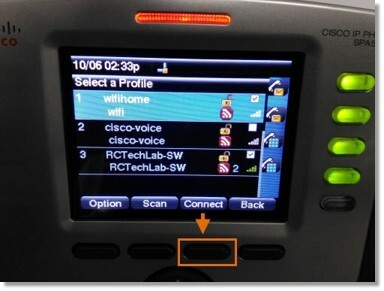 Connect to your router interface by using a computer. Go to the router’s Wireless Protected Setup configuration menu, and then enter the PIN into the field that allows you to setup wireless devices by using a PIN. On your phone, with PIN Configuration highlighted, press Select. 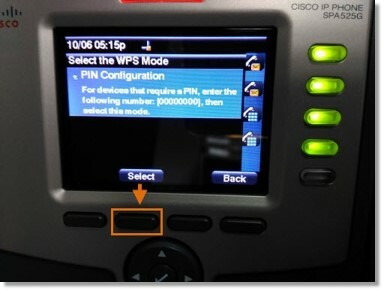 Note: To add the connection as a Wireless Profile, press OK.